Rio Grande, Ohio – The University of Rio Grande and Rio Grande Community College works to keep traditions in Southeastern Ohio alive by providing history courses and promoting the area’s Welsh heritage. One student from the university had the opportunity to witness a historical tradition. 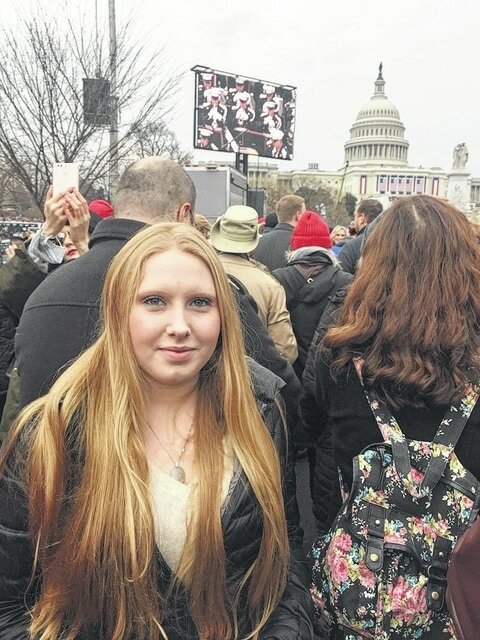 Micaela Casto, a junior, attended the inauguration ceremony of the 45th President of the United States, Donald Trump, Friday, January 20. The traditional ceremony has taken place in Washington D.C. since Thomas Jefferson’s 1801 inauguration, with the first Inaugural Parade taking place in 1805 for Jefferson’s second. Casto said she was excited for the opportunity to attend a ceremony that has such a long-standing tradition and impact on U.S. history. Casto said this made her third trip to the national capitol, but the first time she has been in town for such a large event. Casto had originally planned to go to the inauguration with a national science organization for high school students as an alumni member. When the trip was cancelled, Casto decided to find a way to go to the inauguration ceremony. She and her family contacted Congressman Johnson to see if he could help Casto, and he decided to provide her with some of his own tickets to the event. Casto’s mother, Lisa Casto said she was proud of her daughter for taking the opportunity to go to Washington, D.C.
Casto said she is thankful to her professors for helping her stay on track in her classes while she attended the inauguration. Casto said she encourages everyone to take the chance to watch history unfold in person during similar public ceremonies. Casto is in the BioMedical Track of the Biology Program at the University of Rio Grande and former Post-Secondary Option student with Rio during high school. She is the daughter of Lisa Casto and Jason Baker of Oak Hill, Ohio.